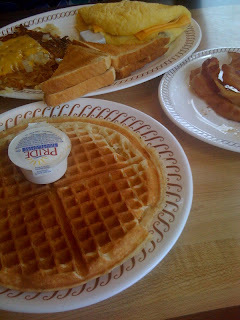 But I just had to share my thoughts on this little breakfast diner, called the Waffle House. I'm not usually a breakfast eater, but their food was delish. I ordered hash browns, an egg omelet, and wheat bread with a side order of bacon and 1 waffle. When I first saw this food, I though to myself...It doesn't look special, this is fattening, and I'm not going to eat all this. I ate everything on that plate AND had the nerve to order another waffle. UGH so friggen good (my mouth is watering while writing this post). Even though it looks a little run down and outdated, don't let that fool you. 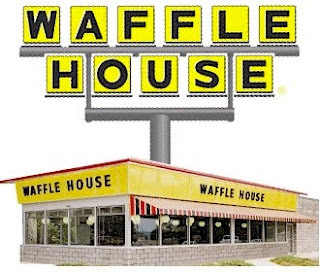 If you have a Waffle House in your area, or visiting a state/ city where they have Waffle House's...STOP IN!